In this work, we modeled and simulated the electric potential generated by point charges in the region of grounded conductor planes for Yukawa potential ( e − μ r / r ) and Coulomb potential ( 1 / r ) . We show the symbolic expression for the electric potential and some graphs for it and for the electric field with different values of μ . We observe that the electric potential decreases as the value of μ increases and that does not allow all the charge to be distributed on the surface of the conductor. electromagnetic courses. Then, the electric field can be obtained in the usual way E = − ∇ V .
According to the MI, a configuration featuring a charge close to an infinite conductive plane, correctly grounded can be replaced by the charge configuration, its image and an equipotential surface substituting the conductive plane. 2) The charges and their images to be arranged in such a way that, within the conductive plane, the potential be zero or constant. The procedure is a very valuable aid since it does not require advanced math knowledge nor complex algorithms; all it requires is a knowledge of the expression for some basic electric potentials as well as the one for the superposition principle. In an interesting work, Griffiths and Uvanovic  studied the charge distribution on a conductor for two potentials: Yukawa potential ( e − μ r / r ) and the Law of Potential ( 1 / r n ) . The aim of this work is to apply MI to a typical problems dealing with point charges and grounded conductive planes in order to find the total potential and electric field, using as interaction among charged particles Yukawa and Coulomb potentials. When obtained through this method, potentials can be established in terms of elemental functions. 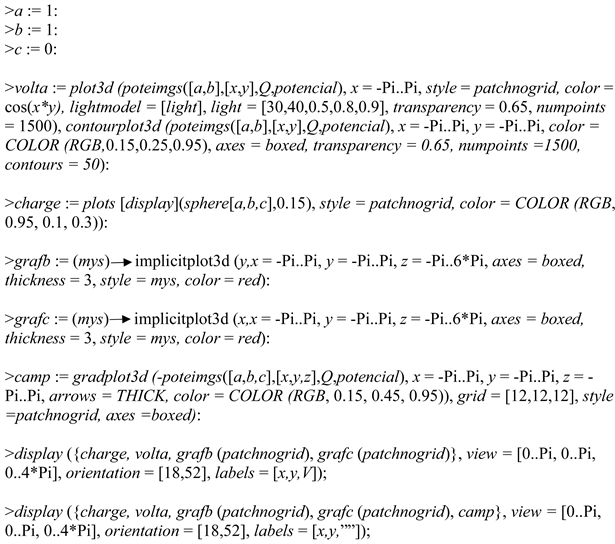 Its analytical expressions and graphs can be shown using Maple. The expressions of the electric field can be long and therefore we do not include them in this work. 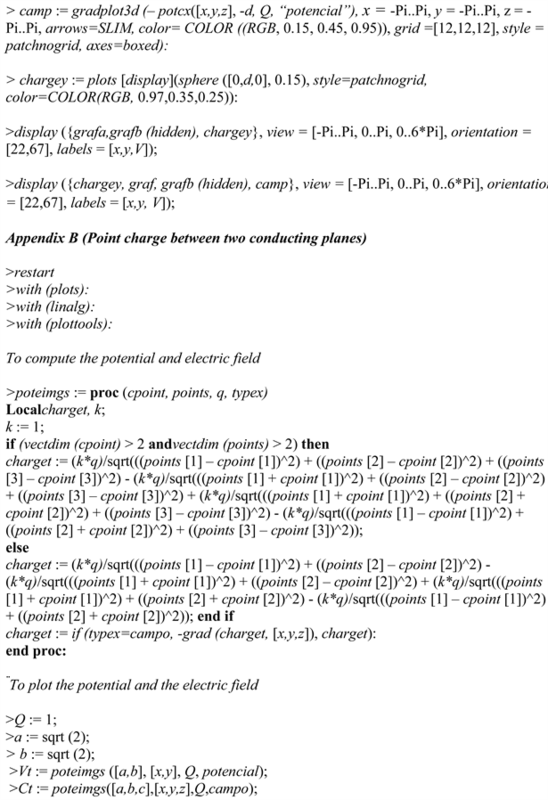 Nevertheless, the reader can use Maple’s instructions in Appendix A and Appendix B to calculate the expressions for the potential and the electric field as well as the graphs shown. The current work is composed as follows: In Section 2, we discuss the case of a point charge located in the region over a grounded plane conductor; In Section 3, we present the case of two grounded conducting planes, perpendicular to each other and a point charge placed in a quadrant between the planes; In Section 4, our final comments are presented. In this section, we determine the potential produced by a positive charge Q, located at a distance d on a very large and grounded conducting plane, as shown in Figure 1. To find the potential in the region y > 0 and to guarantee that the potential in the plane is zero, it is necessary to replace the conducting plane by an image charge −Q, located in ( 0 , − d , 0 ) , as shown in Figure 2. A point P ( x , y , z ) is defined, on which we aim to calculate the potential. Figure 1. Grounded plane and point charge. Figure 2. Q charge and its image. which matches (7) when 1 4 π ε 0 = 1 N ⋅ m 2 / Coul 2 . For the following graphics, we set the values for the distance between the plane and the charge as d = 1 m and the charge was given a value of Q = 1 Coul . Then we used the Maple to generate the plots   (See Appendix A). Figure 3(a), shows the Coulomb’s potential produced by the charge; it can be seen that it meets the boundary condition, V ( y = 0 ) = 0 . Figure 3(b) shows additionally the field lines that perpendicularly intersect the equipotential curves. Figure 3. (a) Coulomb potential, and (b) Potential and electric field. Figure 4 shows Yukawa potential for μ = 5 ; some field lines are also shown. It is observed that the potential decreased and, therefore, the boundary condition in the conducting plane is not satisfied. In this section we calculate the potential and electric field produced by a point charge Q, placed at the point whose coordinates are ( a , b ) between two grounded perpendicular conducting planes as shown in Figure 5. Figure 4. (a) Yukawa’s potential for μ = 5 , and (b) Potential and electric field. Figure 5. Q charge between two perpendicular planes. Similarly to the single plane case, in order to ensure that the potential is zero at the horizontal plane, it is necessary to place a image charge −Q under the plane, at ( a , − b ) . However, since this does not guarantee that the potential above the vertical plane is zero, we add a image charge −Q to the left of such plane, at ( − a , b ) ; this makes the potential at the horizontal plane different from zero. Finally, to comply with the boundary condition of zero potential in both planes, we place a Q charge in ( − a , − b ) . The point charge Q and its image charges are shown in Figure 6. To graphically illustrate the total Coulomb potential, the equipotential curves and the electric field were plotted using Maple in the region where x > 0 y y > 0 , we considered the values for the position of the charge (1,1,0) as well as its magnitude Q = 1 Coul and we used Maple   (See Appendix B). Figure 6. Q charge and its image charges. Figure 7(a) shows the resulting potential; we can see finite values except for the potential at the point ( 1 , 1 , 0 ) , which is where the charge is placed. It is observed that the potential satisfies the boundary condition with each of the planes. Figure 7(b) shows the electric field in addition to the potential. Figure 8 shows Yukawa potential for μ = 5 ; some field lines are also shown. In this case, it is also observed how the potential decreased and no longer satisfies the boundary conditions. Figure 7. (a) Coulomb’s potential, and (b) Potential and electric field. Figure 8. (a) Yukawa’s Potential for μ = 5, and (b) Potential and electric field. charge is necessary; when ∅ = 90 ∘ as in Figure 5, N = 3 image charges are necessary. For this work, we used the MI and Yukawa’s potential as a generalization of the electrical potential produced by a point charge in the vicinity of grounded conducting planes; as a particular case, we obtained its Coulomb’s potential. Yukawa potential decreases exponentially depending on the value of μ and, therefore, and so does the resulting electric field, which was expected. This explains why, in solid conductors, the charge does not fully flow to the surface   and why, in the Coulomb limit ( μ → 0 ), we get the well-known result where the entire charge reaches the surface. We are interested in our students experiencing not only the simulation of potentials and electric fields, but also their modeling. We think that both elements, modeling and simulation   , can motivate them to reach numerical results, as well as to suggest simple analytical and computational procedures. Such combination should contribute to their getting an integral learning experience. 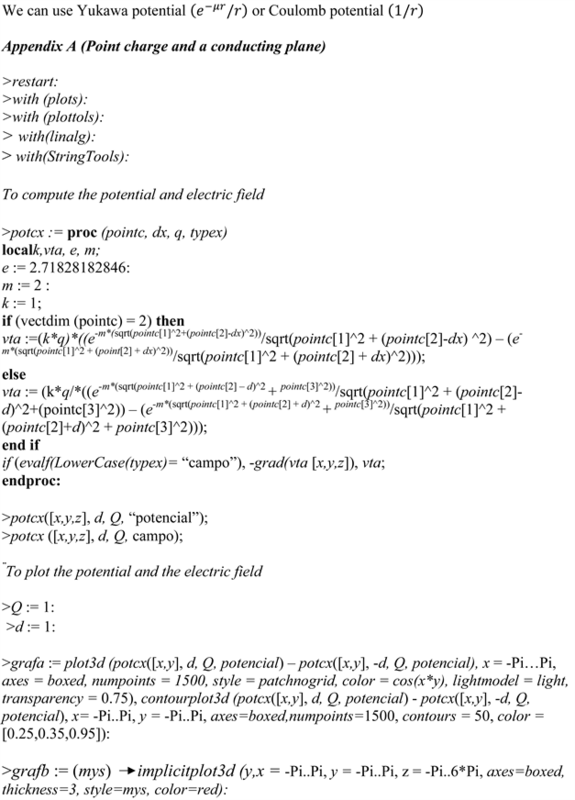 Although both quantities, potential and electric field, could be expressed in terms of elementary functions, the support of a computational tool was very stimulating, particularly for engineering students, who fully appreciate, in addition to numerical values, the graphs that foster the learning of concepts. Finally, we, as professors in charge of elementary courses, are able to address more interesting and difficult problems than those usually solved during electricity and magnetism courses without the hindrance of demanding advanced mathematics or programming knowledge from the students. We would like to express our gratitude to Professors N. Aquino from Universidad Autónoma Metropolitana, Iztapalapa, G. Maldonado from Tecnológico de Monterrey, Campus Central de Veracruz and L. M. Orona from Tecnológico de Monterrey, Campus Chihuahua, for careful reading of the manuscript and for valuable comments on this work. 1. Cheng, D.K. (1992) Field and Wave Electromagnetics. 2nd Edition, Addison-Wesley Publishing Company, New York. 2. Sadiku, M.N.O. (2002) Elements of Electromagnetism. 3rd Edition, Oxford University Press, Inc., New York. 3. Clayton, R.P. and Nasar, S.A. (1987) Electromagnetic Fields. 2nd Edition, McGraw-Hill, New York. 4. Shen, L.C. and Kong, J.A. (1987) Applied Electromagnetism. PWS Publishers, Boston. 7. Bueno Pascual, F.E., López-Mariño, M.A. and Aquino N. (2007) Potencial y campo eléctrico generados por una carga puntual entre dos planos conductores aterrizados In: L Congreso Nacional de Física, Veracruz, Veracruz , 227. 8. López-Mariño, M.A. and Aquino, N. (2015) Cálculo del potencial y del campo eléctrico producido por una carga puntual y planos conductores. In: LVIII Congreso Nacional de Física, Mérida, Yucatán, 270. 9. López, S., Veit, E.A. and Araujo, I.S. (2016) A Literature Review about Computational Modeling and Simulation in Physics Education in Middle and High School Levels. Revista Brasileira de Ensino de Física, 38, e2401. 10. López-Mariño, M.A., Hernández-Olvera, J.A., Barroso, L.A. and Trujillo Caballero, J.C. (2017) Graphic and Symbolic Computation: Analysis on the Spring-Mass System. Revista Brasileira de Ensino de Física, 39, e2303.